Katie Walsh, the most successful female jockey in Grand National history, has secured a ride for Saturday's race at Aintree. The 29-year-old, who finished third on Seabass two years ago, replaces the injured Mikey Fogarty on Vesper Bell, an outsider in the 40-strong field. Walsh will be the only woman jockey in the 167th edition of the National. Bookmakers suggest half the UK adult population will bet on the race, collectively staking about £250m. Katie is a respected amateur jockey, and her ride on Vesper Bell will be her third in the race. Both previous times she was riding the favourite - Seabass - for her trainer father Ted. Seabass was 8-1 joint market leader two years ago and came third. Last year, when an 11-2 clear favourite, he only finished 13th. Vesper Bell, trained by Willie Mullins, was around a 66-1 shot on Saturday before news emerged that Walsh had been named as a replacement for Fogarty, who suffered a back injury in a fall at the Merseyside track on Friday. 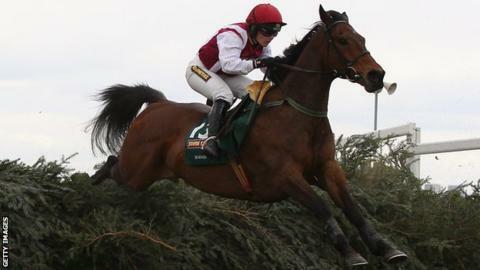 In December, the eight-year-old horse fell in the Becher Chase over the National fences. But Walsh - daughter of trainer Ted and sister of fellow Irish jockey Ruby, who won the National on Papillon for their dad in 2000 and who misses this year's race after being injured at last month's Cheltenham Festival - was confident of doing well. She told Channel 4's The Morning Line: "I'm looking forward to it, it's great to be part of it. "He's run well around Punchestown [in Ireland] a couple of times, he's a big, scopey horse who stays well and I'm looking forward to the ride." Irish champion trainer Mullins also saddles Prince De Beauchene (around 20-1), the mount of Paul Townend. On Friday, Mullins saw Boston Bob become his first winner at a Grand National meeting since Hedgehunter's victory in the famous steeplechase nine years ago. "Vesper Bell is a 66-1 shot who fell here last year in the autumn," he said. "But the horse is a great jumper and stays. He did his best bit of work the other day."